The manifestations of Alagille syndrome include the most complex and most interesting of all pediatric liver diseases. The hepatic disease of ALGS ranges from inconsequential to failure, and the manifestations in many other organs also vary from trivial to catastrophic. The dominant mode of inheritance and the common occurrence of de novo mutations have led to fascinating genetic discoveries, and the presence of a normal gene in all affected individuals may lead to novel genetic therapies based on regulation of gene expression. The ALGS is the most extensively studied of any single gene defect that is involved in human embryogenesis. Notch signaling is an important mechanism for cell to cell communication, having developed early on in evolution, and it is highly conserved in all species studied. 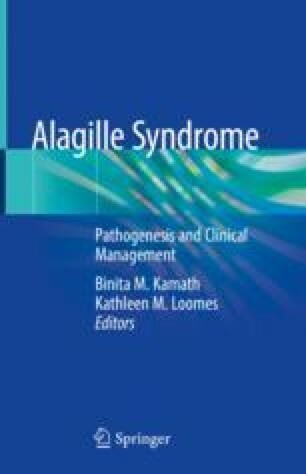 While much has been learned about the Alagille syndrome over the 50 years since its first description, there are many current clinical challenges and opportunities for the development of novel and effective therapies. In the subsequent chapters of this book, the extensive compilation of the knowledge about Alagille syndrome and Notch signaling will serve as a framework for investigation and discovery into the mechanisms and therapies of this extremely important and fascinating disease.